I don’t watch a lot of tv. I really don’t. Honestly, I didn’t watch tv regularly for about nine years (gasp! ), and I also don’t have cable (double gasp!). But now that my OCD college studying days are behind me, I’ve been trying to catch up on Hulu and Netflix, and it’s too much. It’s as though after nine years of infrequent viewing, I’ve lost my taste for weekly tv. I’ve never seen a single episode of Breaking Bad, Game of Thrones, or The Newsroom. I’ve watched a whopping three minutes of Mad Men. And the only episodes of Downton Abbey and Scandal I’ve managed to see involved a woman dying in childbirth and the president murdering a judge. Woah. Therefore, when the Primetime Emmys aired this past Sunday, I was pretty lost. I knew of the many shows being honored, but that was about it. So, I turned to a trusted new medium for insight and commentary: Twitter. And for the next three hours, I kept my eyes glued to the computer screen (my eyes later paid the price for it) sifting through thousands of tweets to help fill in the blanks. 1. Jeff Daniels has really moved up in the world since being Jim Carrey’s sidekick in Dumb & Dumber. I mean, “immeasurable?” Seriously, good for him. Wait…he hasn’t signed on for that sequel, has he? (*runs off to IMDb*) Damn it! Why, Jeff? WHY? 2. Contrary to popular belief, people in Hollywood actually grow older. And apparently Robin Williams has aged since I saw him in Mrs. Doubtfire. It’s literally unbelievable. 3. 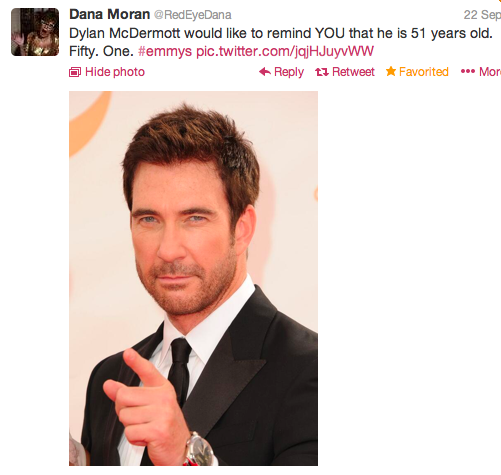 Well, unless you’re Dylan McDermott, who still pretty much looks like he did on The Practice. Oh, The Practice. Anyone else remember that show? Lots of lawyering and yelling? Yep, yep. (Damn those new Hostages promos for making me slink off to Hulu to start a re-watch). 4. And I should probably stop referencing the ’90s because it’s…not the ’90s?! 5. No, it’s not the ’90s. IT. IS. NOT. MY. CHILDHOOD. 7. I guess those days are over, though, and cable is now KING. 10. But at least everyone seems to agree that Breaking Bad is the best drama on tv. HANDS DOWN. 11. In fact, it’s so good that I probably don’t need to watch next year’s telecast because it’s just going to sweep the awards. 12. And because some of the actors are still going to be robbed, like they were years ago. 14. But even more unfortunate, people in the entertainment industry are still dying. And apparently they’re dying at greater rates than some of the characters on the bloodiest tv shows. Or in other words, I haven’t really missed much since the ’90s/early aughts. Thanks, Twitter.